Todd Blackadder slammed his Bath team after Gloucester beat them by a point with the last kick of the game. Owen Williams’ 88th-minute conversion saw Gloucester complete a smash-and-grab at the Rec in the most dramatic finish of the season. Ed Slater scored the try to put them within one, stretching for the line from close-range, which was confirmed after the television match official had watched three minutes of replays. 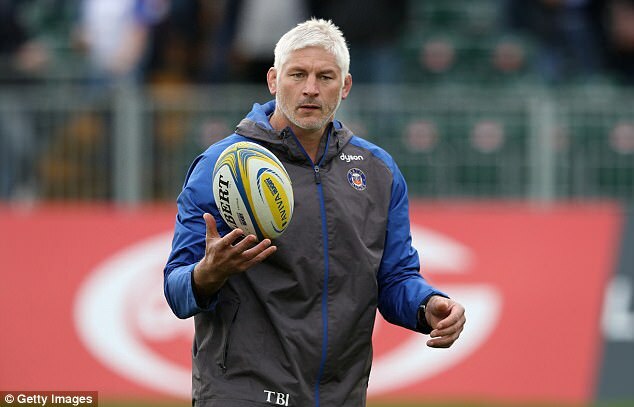 Bath had kicked out rather than wind down the clock by going through the phases with a minute left, which left director of rugby Blackadder angry. ‘That was the old Bath,’ he said. ‘Where we don’t fight, we don’t turn up and we don’t do the little things that give you the best opportunity to win games. The win was Gloucester’s first away from home in the league since March, when they beat Bristol. And Slater was glad to be the hero in his first West Country derby having been swapped for Leicester’s Jonny May in the summer. Bath led on three separate occasions and Semesa Rokoduguni scored his sixth and seventh tries of the season to put him top of the Premiership scoring charts alongside May. Rhys Priestland hit three penalties and a conversion but missed eight points from the tee, which ultimately proved vital. Willi Heinz gave Gloucester an early lead after a fine burst from Henry Trinder, and when he scored again in the second half, latching onto a wonderful John Afoa offload the Cherry & Whites led by four. Slater, though, pulled the plug on Bath.